How To Apply for RGUKT BASAR IIIT Admissions 2018 ( 6-Year Integrated B.Tech Program): Admissions to 6-Year Integrated B. 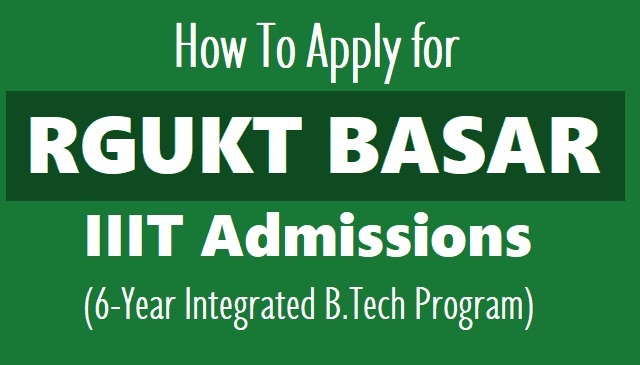 Tech Program-2018 , RGUKT BASAR IIIT Admissions, RGUKT BASAR 6 Year B.Tech Program Admissions. Applications are invited for admission to the first year of 6-Year Integrated B.Tech program at RGUKT Basar (Telangana State) for the academic year 2018-2019. 2018, in the first attempt. 1. The candidates should apply through TSOnline services only. 2. The application fee should be paid in cash at TSOnline service center, for which the center will issue a receipt. 4. If any candidate applies more than once, then the latest application will be considered for the selection process. 5. Immediately after submitting the application through online, the applicant should send its print-out duly signed along with copy of the receipt mentioned in 2(c) above and the relevant certificates to The Director, Rajiv Gandhi University of Knowledge Technologies, Basar, Nirmal District, Telangana State-504107, by Speed Post / Registered Post. The candidates should write on top of the cover ‘Application for Admissions 2018 RGUKT Basar’. Step 4: Click on the Apply Now Button under the UG Admissions - Admissions into 6 Year Integrated B.Tech Programme Section. Step 5: Now, Undergraduate Admissions - 2018-19 Web page will be opened. Step 7: Undergraduate Admissions - 2018-19 Online Application Form Will be displayed. Step 8: Fill the required insformation of you. f) Physically Handicapped (PH) certificate in the prescribed proforma by those claiming reservation under this category (for details see Annexure - VI). g) Children of Armed Forces (CAP) certificate in the prescribed proforma by those claiming reservation under this category (for details see Annexure - VII). h) NCC certificate by those claiming reservation under this category (for details see Annexure - VIII). i) Sports certificate(s) at the level of inter-district and above by those claiming reservation under this category (for details see Annexure - VIII).